By Bill Zehme, author of the forthcoming Carson the Magnificent: An Intimate Portrait (Simon & Schuster). Carson was, for certain, the bump in the night that delivered hope and perspective. 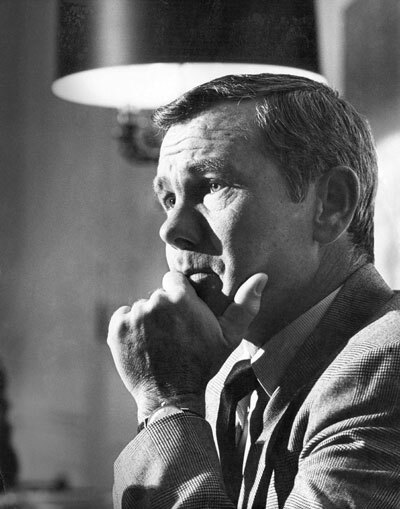 His opening monologues (ever his pride and joy) navigated us through seven presidential administrations, rasping out the perfect pitch of populist incredulity, always with subtle precision; the Carson version of history, as it occurred daily, anchored mass sanity funniest in a world gone perpetually mad. Also, like no one else in a latter century lifetime, his was the last face flickering onto the brain before so many billions of slumbers, thus launching the dreams of generations. (Medical science, no less, immortalized him by naming in his honor a form of temporary one-eyed blindness caused by burrowing the other eye into a pillow while nodding off watching TV: Carsonogeneous Monocular Nyctalopia.) Indeed, the great director Billy Wilder once gratefully proclaimed him “the Valium and the Nembutal of a nation.” Only two weeks before the king’s abdication, Frank Rich put it this way in The New York Times: “The actual content of a Carson show did not matter. At a time of anxiety, who cares about the color and material of a security blanket?” The unassailable upshot: No other performer had ever felt so dependably essential to his country’s sense of well-being—or, quite likely, would ever wish to. Famously the most public of private men and vice-versa (which was only part of his peculiar genius for longevity), he could joke, “I will not even talk to myself without an appointment.” While openly on display for three decades of nocturne, he was at the same time barely spotted anywhere outside of television screens—which was how he liked it, then and ever after. (His gift for hiding in plain sight didn’t diminish during the intractably cloaked thirteen-year retirement he spent relishing spotlight-free living; Garbo and Salinger had nothing on his powers of ordinary civilian invisibility.) Still, a silken aw-shucks Everyman exemplar—confident and dashing and eternally boyish—he was also slippery as the night is long, never easy to pin down, yet always an affirming presence to behold whenever he could be beheld: “And that’s why Carson has no equal—not even Cary Grant, whom he resembled in shyness, smartness, and lethal counter-punching style—as a model of what an American man might be,” wrote David Thomson, the fanciful British expatriate film scholar. “He came away from that scrutiny as both an American ideal and a mystery man; agreeable and withdrawn; good company and intensely alone; attractive yet cold . . . always there, never graspable. . . . I feel he stayed unknowable so as to be seductive, to stay there, on TV.” Carson, the staunch Midwestern pragmatist, would simply ascribe all that to good business sense: “Always leave them wanting more,” he would genially repeat to quell chronic speculation about his personal world—all evasive twinkle, all the time. Most viewers also knew that as a kid he learned magic (enter The Great Carsoni! ), largely to overcome shyness, and never stopped creating illusions, especially when trapped at parties (he went nowhere without a deck of cards) or when making hypnotically irresistible television after dark. He entered existence on October 23, 1925, in Corning, Iowa, the middle child of Homer L. (“Kit”) Carson, a kindly power-company yeoman, and the former Ruth Hook, an exacting woman of refinement with thin patience for her future-famous son’s strivings. When John was eight, the family settled in Norfolk, Nebraska, where just under a handful of years hence he snagged a friend’s magic-manual and would, at age fourteen, as Carsoni, earn his first performance fee—three dollars—from the town Rotarians. Thus, as Time’s Richard Corliss saliently suggested, he’d “found within himself the secrets of conjuring—misdirection, poise, timing, a commanding personality—which are also the secrets of standup comedy.” All pieces more or less fell into place thereafter with haphazard surety. 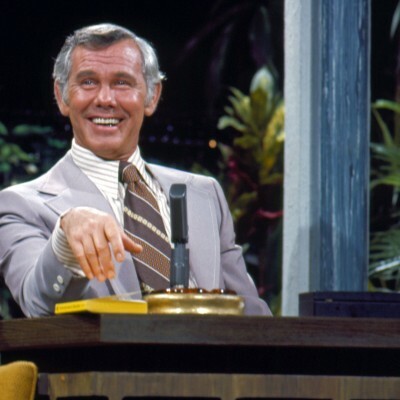 Starting in Omaha, where TV arrived the same time he did, at station WOW (true), he began a life of hosting that led him to gilded Los Angeles and local acclaim on KNXT, the CBS affiliate, with quirky novelty programs that eventually beguiled the network to shove him into his own national primetime Thursday night half-hour, The Johnny Carson Show (debut date June 30, 1955), an ongoing experiment in sketch-and-song confusion that crashed after 39 weeks. 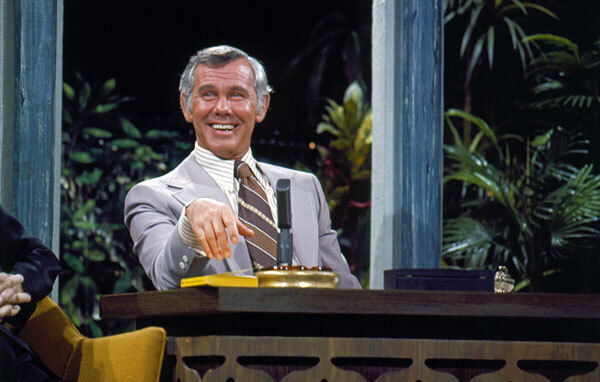 His promising glimmer resurfaced and shone at last some 18 months later in New York, helming the game show originally (if ironically enough) called Do You Trust Your Wife? before the titular Trust question was generalized ungrammatically. Forty years after having first seized the night to do what he and his country liked best, and one decade after he had quit, I found myself the beneficiary of his lively company for a long red-wine-sipping lunch, as he submitted to the lone magazine profile (or media visitation of any sort) since the early onset of his retirement vanish. “I think I left at the right time,” he told me that January afternoon in 2002, which also turned out to be almost exactly three years to the day when emphysema took him forever (January 23, 2005). “You’ve got to know when to get the hell off the stage, and the timing was right for me.” (IT’S ALL IN THE TIMING, I knew, was his life’s credo as well as the hand-stitched mantra on a needlepoint throw pillow he treasured.) Unavoidably, among the grand tales and meandering topics that flew from him that day, he gently groused only a little about being asked constantly whether he missed the work whose standard he’d made unmatchable. With a shrug and a whiff of quiet satisfaction, he repeated the three-word response he gave whenever the question arose: “I did it.” Who could argue otherwise?